← Escolta – a rich history. After walking the short stretch of the Escolta, I found myself right in front of the Santa Cruz church. It’s quite the intersection there…where the Escolta spills out to either Plaza Goiti on the south or Plaza Sta. Cruz on the north side. Either way you go, you’ll find a unique adventure. 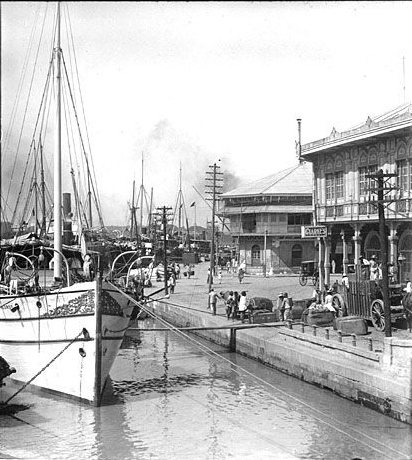 During the 19th century, under the Spanish government, the neighborhood of Santa Cruz was considered the preferred business and residential location due to its proximity to the Pasig River that allowed ships and cascos to load and unload passengers and freight. Prior to the building of the Sta. 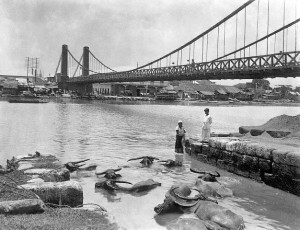 Cruz bridge, there were two major bridges connecting the two sides of the Pasig: the Puente de España and the Puente Colgante. The construction project to build the Sta. Cruz Bridge was started by the Spanish government but completed when the American government took over. It was opened on March 1, 1902. The bridge could not stand the test of the Battle of Manila and was subsequently destroyed and then reconstructed after the war and renamed MacArthur Bridge. Plaza Goiti was the center of the city’s transportation network –the tranvias. The tranvias were owned and operated by Meralco. 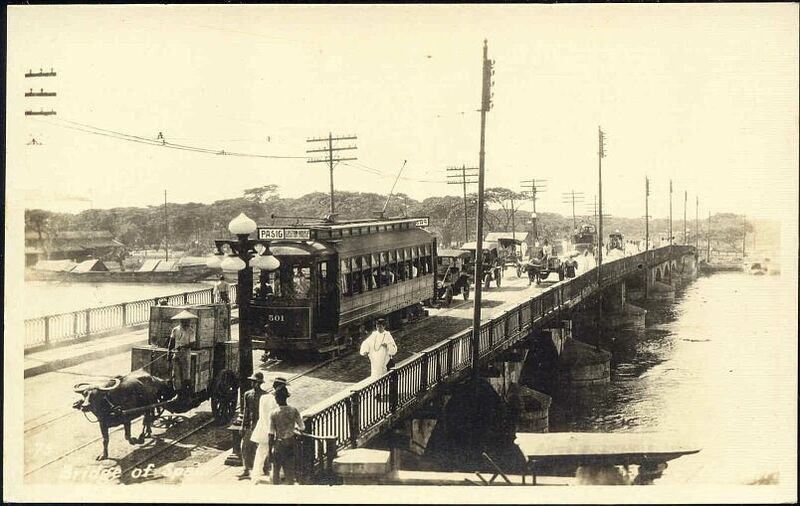 In 1904, the Manila Electric Co. acquired both the Compañía de los Tranvías de Filipinas (a firm that operated public transportation and ran Manila’s horse-drawn and steam-operated tramways), and added La Electricista. Construction on the electric tramway began that same year. 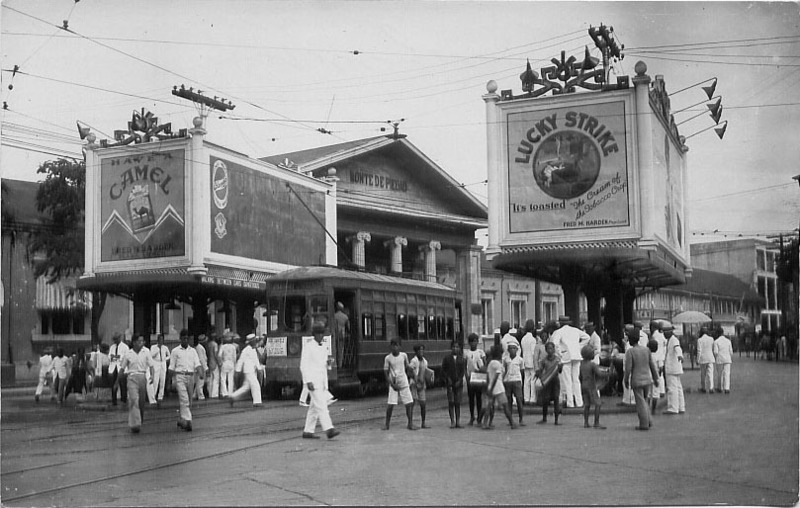 Meralco operated a 52-mile , 170 fleet of streetcars from 1903 to World War II. The equipment and tracks of the system was severely damaged during the war and had to be removed. The Escolta catered to the upscale carriage trade. Plaza Sta. Cruz had the entertainment like bars and vaudeville. 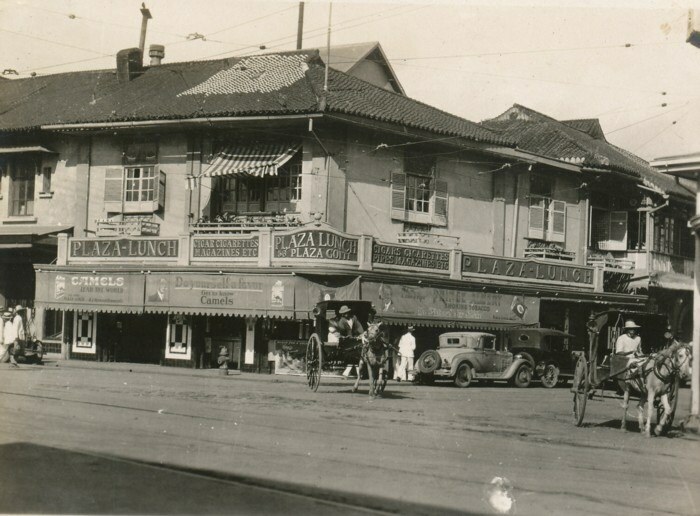 Avenida Rizal was Main Street where the bazaars, movies, hotels, offices, restaurants and banks thrived. As you cross the Estero de la Reina from the Escolta, you are faced with the ancient Santa Cruz Church. The Jesuits built the first Catholic church in the area where the present Santa Cruz Parish stands on June 20, 1619. The Jesuits enshrined the image of Our Lady of Pilar in 1643 to serve the predominantly Chinese residents in the area. 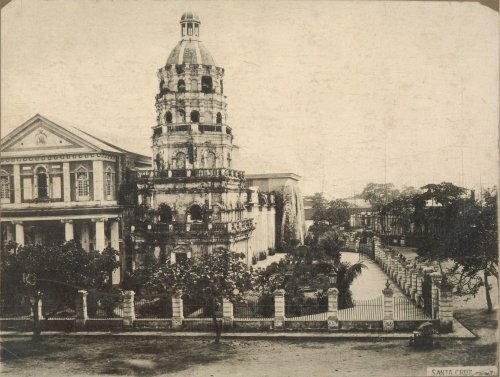 The original structure of the church was twice damaged by earthquakes and then completely destroyed during the Battle of Manila. The present building of the church, reconstructed in 1957, was designed to reflect the Spanish baroque style. To the left of the Church stands the square and in the middle is the Carriedo Fountain. This fountain also has its own history. The name “A Carriedo“, indicated in the fountain means “Avenida de Carriedo”, which commemorates the installation of the water system by Spanish Engineer Don Francisco Carriedo of the Department of Waterworks in 1884. The project for public supply of fresh water in Manila started in early 18th century. The Carriedo waterworks was inaugurated on August 23, 1870. One of the benefits of the waterworks was that no charge for water was to be made for poor people. 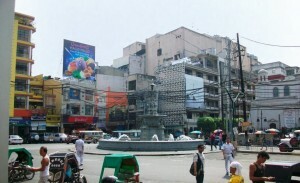 The fountain was relocated in several areas in Manila. Originally located in Plaza Rotonda at the foot of the bridge in Nagtahan, in Calle Alix (now Legarda Street). Just a few years ago, a new replica was built in Plaza Sta Cruz. The original fountain was actually made of marble and bronze. Before the war, Santa Cruz was abuzz with activity. Around the square was the Tivoli Theater, the Far Eastern, International and Moderna pansiterias, Plaza Cafe, Santa Cruz restaurant, and the New Paris Hotel and Restaurant along with a myriad of shops. One of the more famous is the Panciteria Antigua, featured in Jose Rizal’s “Noli Me Tangere”. The restaurant still exists over a hundred years after Rizal wrote the novel. Since the Panciteria dates back to Spanish times, the names of its Chinese dishes are still in Spanish. who starred in “Tawag Ng Tanghalan” and of course the Elvis Presley of the Philippines, Eddie Mesa. The Tivoli was replaced by the Savoy Theater after reconstruction. It didn’t have the former theater’s class. In the early 1960s it degraded into a notorious burlesque theater that featured live strip teasers on stage. Well, I’m just assuming it was seedy since I was too young to actually go to one of their strip shows ! Here’s a picture of my mom walking across the plaza before the war. 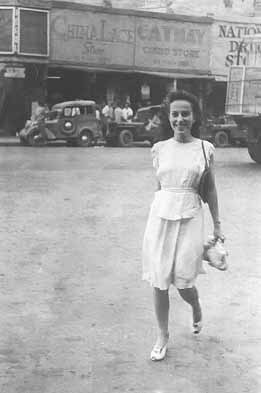 Judging from the sack she’s carrying, she probably just came back shopping from Carriedo street, a shopaholic’s delight. Notice the old jeepney over her right shoulder. The army Jeep hadn’t yet been used for mass transportation. Austin Bantams were quite popular although reputedly quite small – not like the mammoth jeepneys of today. Before the war, the local businessmen who may have had shops and business along the Escolta and around Santa Cruz, met at Silver Dollar Saloon with its long mahogany bar made famous from Mandalay to Singapore for its carpet of silver dollars imbedded in the bar top. Another favorite hangout was the Plaza Lunch owned by Fred Harden who also managed to snag the sole distribution of Camel and Lucky cigarettes. 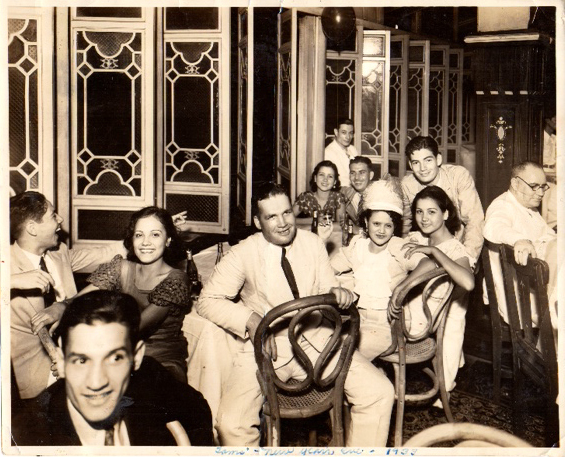 Plaza Lunch in Plaza Goiti-1940. It was designed as a typical American lunch counter with white tiled floors, a counter and stools reminiscent of any American lunch restaurant of the Thirties. I had the pleasure of interviewing Sally Harden, Fred’s daughter, whose family was interned at Santo Tomas during the occupation. 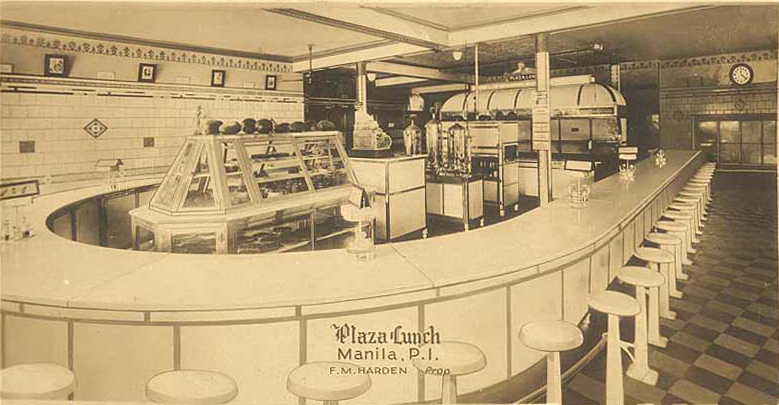 She described the Plaza Lunch as the hub of informal and at times, important business meetings. Plaza Lunch at Plaza Goiti and Carriedo. Tom’s Dixie Kitchen was a landmark by the time war started. 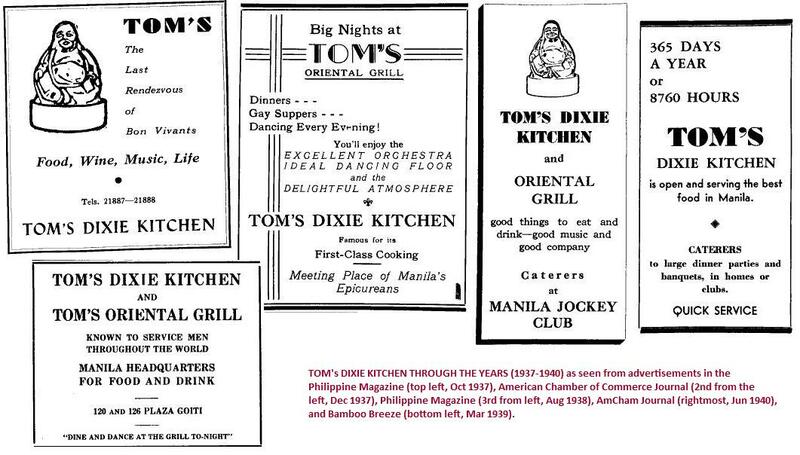 Tom Pritchard, a large, affable black man and quite the smart restauranteur, settled in Manila after he got out of the Army, worked as a chef at Clarke’s Ice Parlor then started his own cafe. It started out as a lunch counter with a few small tables with Tom helping prepare and serve the delicious Southern-style American dishes. It was soon enlarged and occupied about a quarter of the whole block on one side of Plaza Goiti. He also opened Tom’s Oriental Grill featuring upscale dinners, an orchestra and dancing. Thanks to Philip Garcia for this great photo of his mom and her sister, Rosa del Rosario, celebrating New Year’s Eve, 1933 at Tom’s Dixie Kitchen. Tom’s was a place to meet as well as eat. It was open night and day and theater and concert goers went there after the show for a bite before going to bed. The place was always full of various celebrities, government officials, bankers, businessmen and off-duty servicemen. It was a lively place but Tom always kept an eye out to keep things orderly. Plaza Goiti seemed like a twin plaza. It was also the centralized hub of activity with the Monte de Piedad and Savings Bank, now the Bank of the Philippine Islands, apparently where Manuel Quezon once worked as a teller. 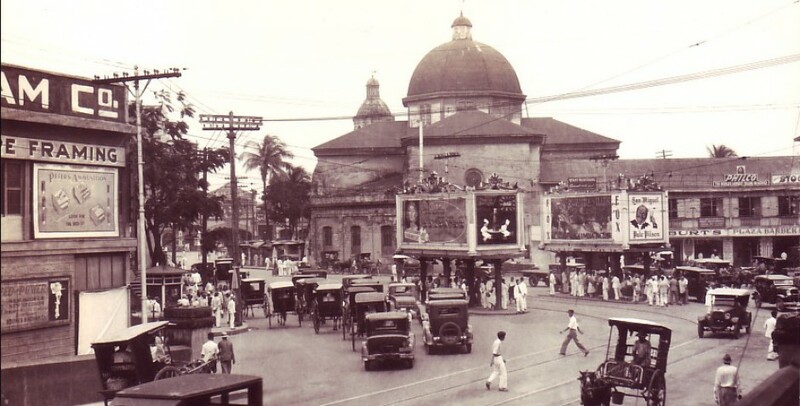 Before the American occupation, the Catholic Church encouraged the establishment of the Monte de Piedad (Mount of Charity) to discourage exorbitant interest demanded by usurers at the many pawn shops around Manila. 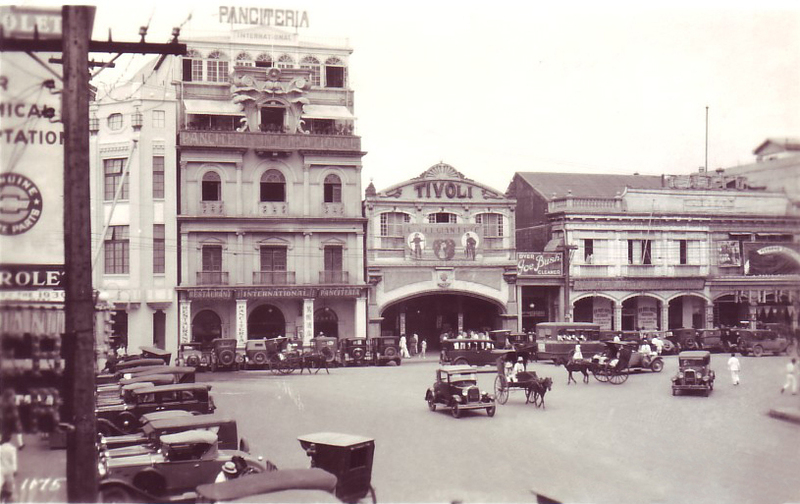 Along with Tom’s Kitchen and Plaza Lunch, Plaza Goiti was sort of a gateway to the Avenida Rizal shops and theaters as well as the Santa Cruz (MacArthur) Bridge that would take you across the Pasig and on to the Metropolitan Theatre, Post Office, City Hall, and Intramuros. 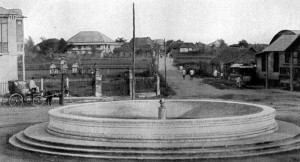 Plaza Goiti 1920s-Monte de Piedad bank on the left. Was it really that lovely back then ? All we can tell is from photos. The city looked cleaner. Of course there was less traffic, less congestion, fewer people and no LRT, but I wonder if we would have been comfortable in that era. No iPads, smartphones, internet or email and think about all those calesas and horses mucking up the streets, the slow tranvias hogging the road. Okay I’m being a cynic but ah…it would be nice to hop into a time machine and visit – maybe just for a few days ? Enjoyed reading your commentary and seeing the photos. on “seeing”, let’s get together one of these days. To Frank Eulau: Are you related to Dr. Kurt Eulau? He was our EENT doctor in the late 50’s and early 60’s. I remember his clinic was along San Luis Street adjacent to Luneta and the Jai Alai Building (walking distance). I remember he was German and considered one of the best, if not the best, EENT doctors during that time. I am heartened to know that my site has had over 2000 visits since I put it up only three weeks ago. Apparently it has continued to hold interest for some folks. I enjoy the research I do to make the site interesting – it also increases my knowledge and appreciation for the Manila of the past-the Manila I used to love and still do. Thank you for your comments. Lou…another outstanding chapter of our favourite city’s history! Especially got a kick out of the photo of the Siver Dollar Saloon with Uncle Sam’s Loan Co. UPSTAIRS….must have been real handy for some folk! JD. Lou, I just came across this site. Thanks so much for sharing. I’m looking forward to more! Very nice article and photos. I particularly like the photo of Plaza Sta. 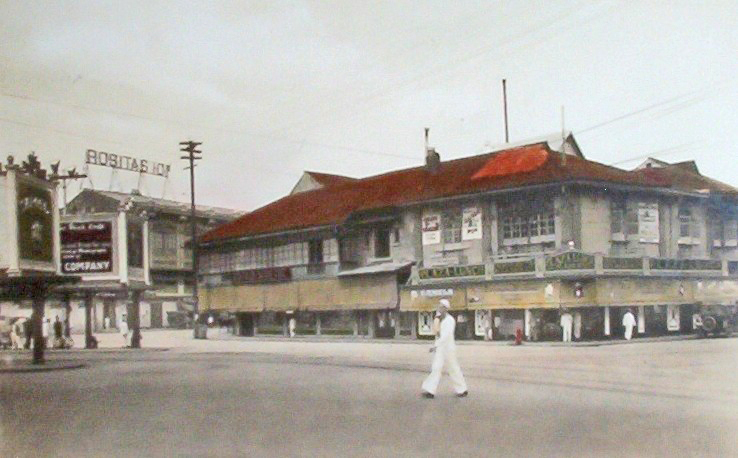 Cruz-1930s – the place is so beautiful back then – sayang. Of course. Please do. Thank you. I’m setting up a webpage to promote my book about the American nurses who served in the Philippines during WWII, and I need some “Beautiful Manila” pictures. These certainly qualify. Do you mind if I use a couple of them? Do you their source? I interviewed one of the nurses’ daughters regarding her mother’s experience at Santo Tomas. The nurse was Lt. Frankie Lewey. She was quite excited when I showed her a photo of the nurses being evacuated after liberation. That’s when she pointed out her mother to me and said she had never seen that picture before. Quite emotional. I purchased Victims of Circumstance a couple years ago as part of my research. It was beautifully done and a great resource to anyone who wants to know more about Santo Tomas. My website will go live in a few weeks. I’ll be happy to add a link to your website on my resources page. The name of my book is A Pledge of Silence and will be out around the first of the year. Thank you ! If you’ll send me your link when it’s up, I can also add it to my website to promote your book. Cheers, Lou. What a joy to have stumbled on your blog. May I ask you–is it possible for you to post a link to the map on top of which your posts lie? I see from the date and language that this map was created during the reign of Louis XIV. I would love to see the map in its entirety. Thank you. My name is Lou Gopal. I was born and raised in Manila. Left after graduating high school in 1962 and now live in Seattle. My maternal family, Zaragoza, extends over 8 generations in Manila, my grandfather was Busto from Madrid. My father was from India, settling in Manila in 1935. Thanks for your comments Bob. Please give my regards to Waldette. She was a tremendous help when we were doing our research for the Santo Tomas internment film. One book I’ve enjoyed is the Manila Americans by Lewis Gleek. It starts with the American history of American entrepreneurs at the beginning of the 20th century in Manila. Cheers ! Napakalinis ng paligid. Bakit hindi kayang gawin iyan ngayon? Dahil ba sa kawalan ng disiplina? Sana maibalik ang disiplina. Ito ang dapat i-emphasize sa mga paaralan… clean and order, obeying traffic rules, no littering, post no bill, don’t step on the grass, don’t pick flowers, etc. Talagang bang hindi na maibabalik ang ugali ng nakaraan? Sa dami kasi ng tao o overpopulation, masdan mo ang kapaligiran… masukal, marumi.. I long to see you again, old Manila. I miss the sun that used to bath me, the clean air that helped me breathe, the safe streets by night and day, the jolly magtataho and his clean taho, the sorbetero and his clean sorbetes…. where have all these gone ? Thanks, Lou. Ang mga katulad mo ay hindi dapat mawala. Kailangan dumami ang katulad mo upang kahit paano ay mapagtanto ng mga ipinanganak ngayon na ang bayan natin ay naging maganda rin naman at maaari nilang pagtulungan ibalik ang ganda nito. I love this land. I believe it was during the American time that Manila was at its best. There was urban planning pareho ng ginawa nila sa America. Sa nakikita kong deterioration ng Manila, parang gusto kong sabihing, I’d rather have a city run by Americans like heaven, than, a city run by Filipinos like hell. Tell me, sino ba ang gustong pumunta sa hell ? Kung si Pres. Manuel L. Quezon gusto niya sa hell, siya na lang. Sana hindi niya ito pinatitikim sa atin, katulad ng natitikman ng mga Manilenyo ngayon. Peace! God bless Manila. Sabik na sabik akong makita siya sa kanyang dating ganda. 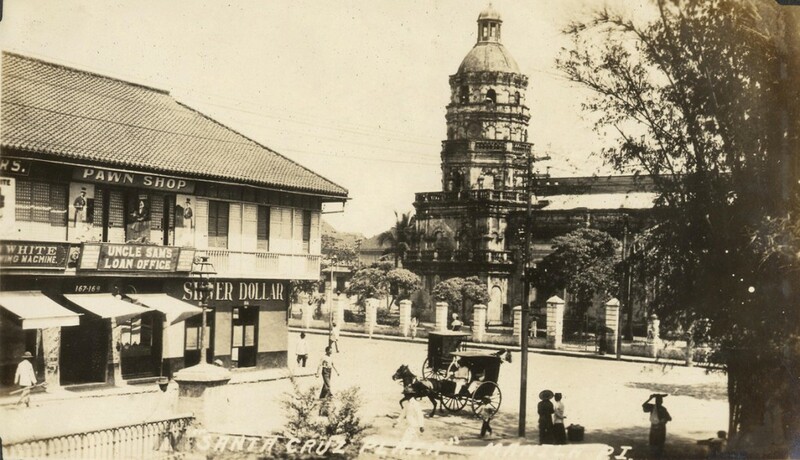 thank you mr.gopal for sharing your past with us.how beautiful manila is long time ago.please share us more more power! I am speaking from memory. The jeepneys, I believe, were Austins, British made. They were mini-cars. Re the tramvias pulled by animals, it seems that it was Ayala y Cia which pioneered it in Manila. Meralco eventually bought it when it turned to electric power; they owned the power company, both the generation and distribution. You are correct Ernie. Friends of mine tell me that was the Austin Bantam, imported before the war. Are you old enough to remember the “dokars” ? They were disassembled automobiles with the front portion removed to allow hook-up to a horse. Sort of a horse and auto-buggy ? I have a picture of my parents on their wedding day in March 1943 with a dokar all decorated with flowers. Also, during the occupation, the buses were adapted to run on charcoal. I’m not quite sure how that was done ? Hi George, thank you for your comments. I remember my mother taking me up to Paranaque and the Baclaran Church when Dewey Blvd. ended there. Boy, it has really changed a lot, hasn’t it ? I understand there is move afoot to reclaim more land for commercial purposes. This makes me sad to think that we’ve strayed so far from the original vision of the grand boulevard designed by Burnham. I’m not a history expert and certainly not with the Spanish-American war and the Philippine revolution but I will start my research to see if I can do it justice. It does seem strange that the occupational forces always call the fighting “insurrection” rather than revolution. Perhaps the label is in the eyes of the beholder ? There were many Filipino heroes of that war and you are right, unfortunately they have not been given their rightful place in history. An INSURRECTION is a synonym for Revolution, Uprising, Mutiny etc., all words that define a violent effort to take control f an existing order or government. However, as a retired military man I must say that common use defines the conflict as an INSURRECTION, if it was unsuccessful and a REVOLUTION if it was successful. If George Washington and the 13 colonies had been unsuccessful in their quest for independence, then the war of 1776 would have been called the “American Insurrection” by most historians. If the Filipinos had been successful in their conflict against the Americans and gained independence in 1899, then this conflict would have been called the “Philippine Revolution” by historians as well. We soldiers have these tongue in cheek definitions: A Revolution is a legal conflict; an Insurrection is an illegal conflict. This is because the winner makes the rules and the loser has no choice but to follow those rules.. It looks like a (pre-war) Jitney, its usually based on either an English Austin or American Austin (later renamed American Bantam), that vehicle in the photo appears to be based on an American Bantam. 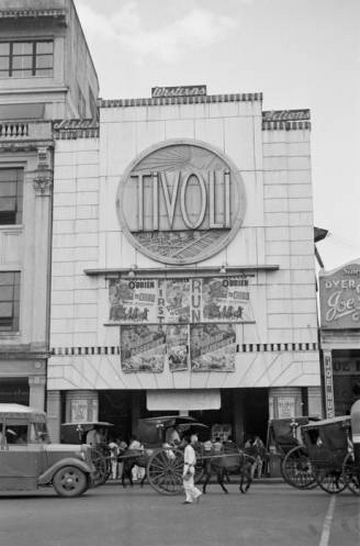 I would like to add here that the Tivoli Theater was the home of Cowboy movies during the late thirties. My friends at LaSalle and I used to meet every weekend to watch these movies , which also featured those serial movies such as Flash Gordon, Zorro and others. Some of the Cowboy heroes were, Tom MIx, Buck Jones, Hoot Gibson, Bob Steele and the singing cowboy, Gene Autry. And those mini buses which were the precursor of the jeepneys were then called autocalesa. It took only 5 centavos to ride in from Vito Cruz to Plaza Sta Cruz. 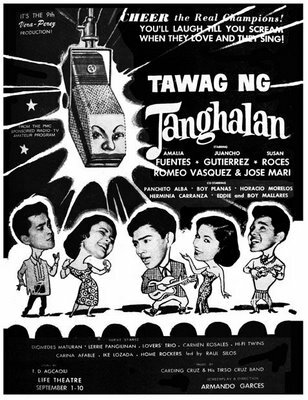 Nora Aunor can’t be in “Bodabil”, she only became known when she won the Tawag ng Tanghalan in the late 60s. Hi, Lou. The pictures you have here are awesome! 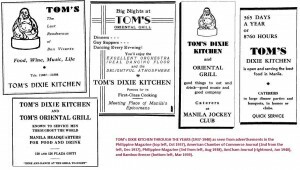 I have been looking for a picture of Tom’s Dixie Kitchen for years now. I have written a blog about it. Only now I was able to see how that famous diner looked like. Where did you get the image, I’m just curious? Is it copyrighted? Could I possibly use it? Do you have a picture of Tom Pritchard, the owner of Tom’s Dixie? If you have, I sure wish you will post it too. 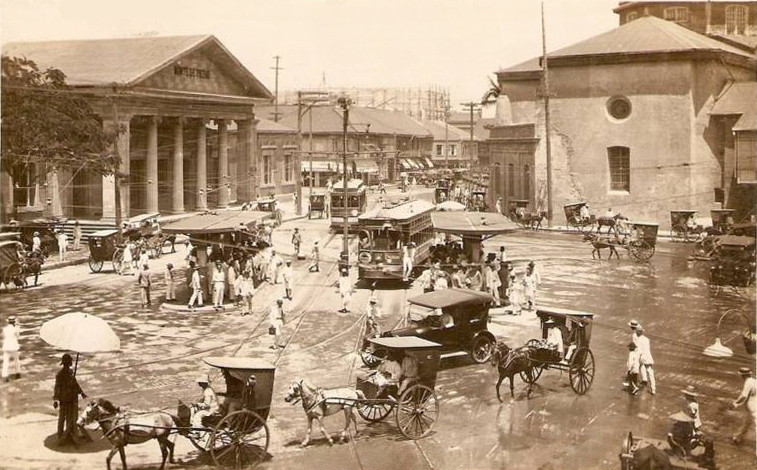 Keep posting pictures of old Manila. Love them, those images from the past. More power! And God bless. Thanks again! Nice presentation! I enjoyed reading. However, I’m very interested in knowing exactly where the Puente de España and the Puente Colgante were located before the existence of the Jones and MacArthur bridges. I know for a fact that there was also a first Jones bridge which was a few meters upstream from where the current Jones bridge is located. Does anybody have any technical information about the Sta. Cruz bridge after it was destroyed and replaced by MacArthur bridge? Was MacArthur bridge constructed using the remains of the foundations of the Sta. Cruz bridge piers? If so, does anybody have any idea what was under those foundations? There is only one Jones Bridge. And it is that unsightly yellow thing spanning the dirty grey garbage disposal unit that is the smelly Pasig. Please visit http://www.lougopal.com/manila/?p=1410 & 472 for more info about the Puente de España & the Jones Bridge which replaced it. A little FYI. The Magallanes Monument was originally placed somewhere within the present-day foundations of the Jones Bridge (hence there was before a Paseo de Magallanes, after the monument); before relocated by the Americans in the Pasig-facing side of the Intendencia/Aduana. Puente Colgante is the present-day Quezon Bridge. Very nice collection of memories. I have been looking for Panciteria Moderna panciteria canton recipe.What happened to that restaurant ? It twice was on fire and now gone. Thank you very much for the nice pictures and memories. 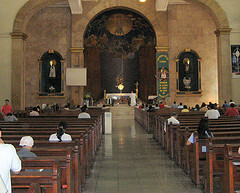 Good day Lou: I have historicphilippines.com and in doing some research for another post on a historic church, I arrived at your site. I am amazed by the historic pictures you have managed to collect and congratulate you on the fantastic work you are doing. I was hoping to be able to use some of your descriptions and some of the photos that would fit into my own stories with proper attribution of course. I look forward to hearing from you sometime soon. Best Regards. Mas gusto ko pa ang dating maynila keysa ngayon . kung may pagkakataon lng ako na bumisita sa nakaraan para makita ang ganda nito at masilayan ang ganda ng nakaraan . Thank you for this meaningful and heartwarming website. It is your “Heart Work!” Reading it awakened so many treasured memories of my childhood. I really appreciate your love and respect for Manila. My Dad told us many stories, happy and sad, about old Manila (Sta. Cruz, Quiapo, Binondo, Azcaraga). He said that Plaza Sta. Cruz used to be the hub of barter during WW II. People (like him) exchanged goods and food just to survive! It was also where innocent babies where snatched by Japanese Soldiers from their mothers. The poor babies were thrown in the air and were caught, violently and without pity, with bayonets! Horrible acts to witness but my Dad and the people needed food for their families! Eventually, he and a group of men were picked up by the Japanese soldiers. They were brought to Palawan as prisoners of war to do manual hard labor from sunrise to sunset. They were deprived of food and water and were tortured while doing labor. My Dad and 3 more men escaped dangerously rather than die there. He alone survived to tell their story, but he went home with severe Malaria that almost killed him. However, worse than this, was living with the war trauma (anger and depression) that plagued him for the rest of his life. Those who stayed in Palawan, he said, were also killed later on by the Japanese soldiers when the construction project was finished. Yes, these men’s LABOR & LIVES were the price they paid for being hungry Filipinos doing barter trade in Plaza Sta. 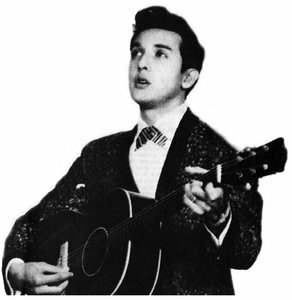 Cruz at that time! Quite a price to pay! In the 60’s Sta. Cruz for me was a hub of happy childhood memories..Sunday lunch at Wanam and Moderna Restaurants with my family. Strolling along Downtown (COD, Good Earth Emporium, Otis, Shoe World) with my Mom was a treat for me!! We would then proceed to the Black Nazarene of Quiapo to pray. The event concluded with us eating delicious pancit palabok wrapped in banana leaves with a glass of refreshing halo-halo at Quinta Market. I am so happy to share the “Old Manila” that has been fondly kept in my heart. Maraming Salamat sa iyo, Ginoong Lou! How wonderfully said. Thank you for sharing your memories with us ! I was born in Sta. 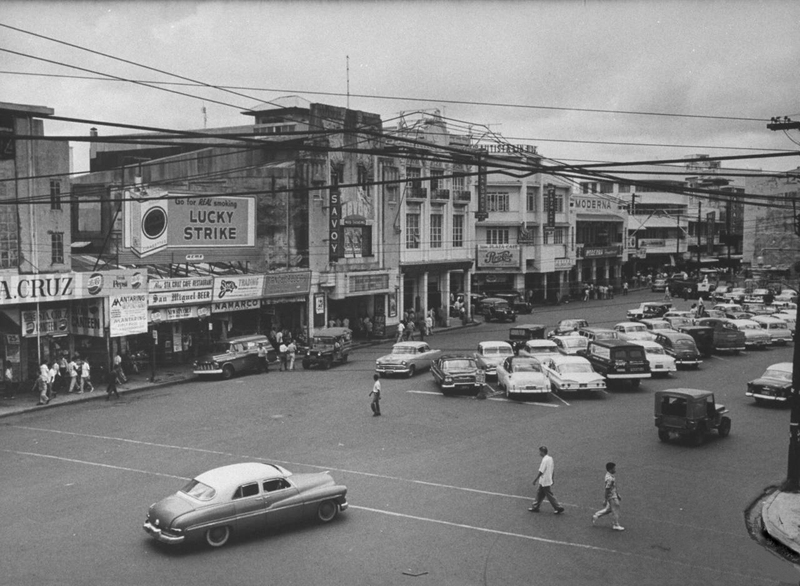 Cruz in the early 60s, near the Blumentritt area. Not quite like the bustling area of downtown. My relatives used to manage a small photo studio near the Noli theater at the corner of Laguna St. and Avenida Rizal. But my earliest memories consisted of going to the Good Earth Emporium with my Mother and later having some siopao and soft drinks at a small restaurant called Tsien Tsin House somewhere in the area. Then on to Berg’s at Escolta to pester my mother to buy me some small toy or whatever. Some years later, it was browsing and buying American comic books at the newspaper kiosks that dotted the sidewalks along Avenida Rizal near where all those great theater houses used to stand (sigh…). I distinctly remember watching all those early James Bond films with my Dad and Uncle at the Odeon Theater. My Mother just passed away recently, my Dad a few years before. I would like to sincerely thank you for all your stories and photos about old Manila in this gem of a blog, as they remind me of both my parents and other family members who have likewise passed away. Looking forward to more photos and articles. Jones Bridge also known as Binondo Bridge. I went to Avenida to shop & buy toys,comicbooks & clothes during the shopping with his family & friends too. Thank you so much. i am from binondo didn’t know that some of the buildings here were that old. I am Wayne Moises from the United States I am the fan of literature & media like TV books comics newspapers magazines & also internet/website too & my favorite is world history & culture became a worldwide media throughout the world. Great blog !!! Hope you can keep it going.